A lot of you will remember seeing this game on the ZZap64 magazine covertape one issue… but it wasn’t specially designed for the magazine…. It was originally programmed for Ocean, but Ocean didn’t like the game as they felt it wouldn’t sell and decided not to release it, and so Denton Designs were stuck with a complete game. The main problem really was that the vector graphics were a bit slow. 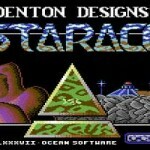 After Denton Designs looked for another publisher, without success, they sold the game to Zzap64 for them to spread on their covertape at a small cost to cover their losses. The game was to never be fully sold commercially… What a waste of a nice game, which I feel Ocean should have tried selling compared to the dross of Double Take. The game itself features some slowish vector graphics, and involves you in a race within a series of tunnels against other crafts (All looking a bit Starfox style)… A nice addictive game, if only held back by the slowness. The game’s graphics were created by the same guy who was working on Megatree, Stuart Fotheringham. Music is wonderfully composed by Fred Grey, and one of my favourite pieces too. All mixed with a brilliant title screen consisting of a CD player to select options before starting. A typical Denton Designs game. “STARACE was planned to be similar to the Atari arcade 3D racing game (whose name escapes me for the moment) that was down tunnels; and have a super-slick front end explaining tracks etc. but from early on it was apparent that C64 was a bit too slow for colour vector graphics but Dave Colclough (the coder) really wanted to pursue it so we did. Ocean didn’t think it would sell and backed out, at the same time they pulled FLASHPOINT on the Spectrum too (another one I did the graphics for); this about the same time as the horrible MAD-BALLS and we went through a lean Ocean time. Maaan, I love this game. Music is a masterpiece. I’m really surprised this game it’s here as weren’t?